Dubbed “the God Letter,” the one and a half page missive was written in German to philosopher Eric Gutkind in 1954, only a year before Einstein died. 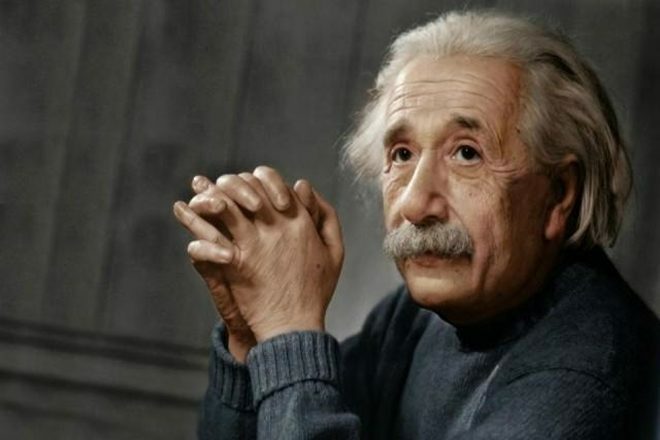 It’s widely held to be a key manuscript in the debate of science and religion, Reuters said, and is Einstein’s clearest statement of his views on the search for meaning in life. The letter first hit auction houses in 2008, when it was bought by a private collector for $404,000, Christie’s told AFP Thursday. “For me the unadulterated Jewish religion is, like all other religions, an incarnation of primitive superstition,” Einstein wrote. The Ashkenazi Jewish scientist had been forced to flee Nazi Germany amid mounting persecution of Jews and intellectuals in the early 1930s. “And the Jewish people to whom I gladly belong, and in whose mentality I feel profoundly anchored, still for me does not have any different kind of dignity from all other peoples. As far as my experience goes, they are in fact no better than other human groups, even if they are protected from the worst excesses by a lack of power. Otherwise I cannot perceive anything ‘chosen’ about them,” he wrote in the letter. Einstein is best known for his immense contributions to science, including discovering the photoelectric effect — best illustrated in the functioning of solar panels — for which he received the Nobel Prize in Physics in 1921, and the equation E=MC^2, which illustrates the relationship between matter and energy, the key principle behind the atom bomb and nuclear power. Einstein also penned two theories of relativity and helped form the photon theory of light, from which the word “quantum” acquired its modern meaning. Although he wrote more than 300 scientific papers in his life, he also authored nearly 150 non-scientific works, including his thoughts on Zionism, war, socialism and, as this letter illustrates, God and questions about the meaning of life. The letter will hit the auction block on December 4, following a public exhibition in San Francisco and New York.